Enjoy a huge furnished deck and peaceful lake views throughout the home. Escape to a waterside retreat at Twin Lakes Lodge—one of our Signature Series homes. This terrific lake cabin has a great location just steps from the sparkling waters of Twin Lakes and minutes from the Twin Lakes Golf Resort. Silverwood Theme Park is a 15 minute drive and downtown Rathdrum, ID—10 minutes away—is home to local favorite restaurants Nadine’s Mexican Kitchen and Westwood Brewing Co. Plus, downtown Coeur d’Alene’s public beaches, parks, dining, shopping, and entertainment is only a 30 minute jaunt. With a large roomy deck with tons of comfortable seating and a lush lawn that leads right up to the water, this is the perfect spot to enjoy life by the lake. It also boasts no stairs to access the inside or outside, making it a great fit for anyone in your group. 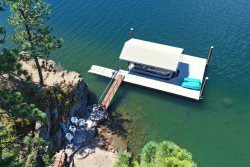 In addition to the waterfront lawn and deck, other outdoor amenities include a private boat dock, patio with a BBQ, and a fire pit. You’ll find that the inside of this home is just as fantastic for entertaining as the outside. The large fully stocked kitchen offers plenty of room for a couple of cooks and a cozy breakfast table makes it easy to socialize while you meal prep. You can serve snacks and check on the kids through the half wall cut out to the dining room. Conveniently located just inside from the BBQ on the porch, the dining room has a wooden table with seating for 6 and a backdrop of floor to ceiling windows. Plus, the comfy couch in the corner is a great spot to post up before or after dinner. The nearby large living room offers lake views through the tall windows, tons of seating, and a game table for 4. For sleeping arrangements, this lakefront home has 3 roomy bedrooms, a single trundle bed in the living room, and 3 full bathrooms—2 with showers and 1 with a shower/tub combo. One bedroom has a queen bed, attached bathroom and deck access, the second also has a queen bed and attached bathroom, and the third has 2 twin beds and deck access. Whether you’re taking a dip in the sparkling water or enjoying your morning coffee in solitude on the deck, you’ll feel miles away from it all while still being near a wide variety of dining and entertainment. They were excellent to work with! I was surprised that there were homes available Labor Day weekend and the selection. VRA personnelV were so helpful and willing to help me even on a weekend. Everyone was friendly and knowledgeable of the area. Loved that it was right on the water. The view was great, neighbors weren't right on top of us, but very friendly. Fishing was amazing and very much a family lake vs. tourist lake. We were looking to go somewhere that we could get away and enjoy each other. This place was perfect for that. We had our own space, but were able to spend tons of time out on the porch back porch and the lake. It was a wonderful time. We liked it so much that we are thinking of buying property there. Everyone at vacation rental authority was very friendly and professional. I loved working with this company. We had a very nice weekend with our adult children and 2 grandkids. The house was perfect and we enjoyed the deck and dock. The team at Vacation Rental Authority were excellent. I would definitely rent from them again! The home had three good sized bedrooms. New air-conditioning units in 2 bedrooms and lots of fans. The lake and dock was a second home for the grandchildren. Fun place for a family to enjoy Twin Lakes. Lindsay Crum was the best! Very prompt in answering e-mails and extremely thorough in walking us through the rental process. Robert-the-boat-guy was helpful and amiable and communication was easy. We wanted to avoid crowds, and this was the perfect place! Just about 10 steps from the bottom step of the deck on the house to the shoreline, and the water was shallow enough (footing was rocks, not seaweed) for grandkids to splash and play. Even on Saturday, July 4, the waters were not overly crowded. The big trees right in front of the house gave us much-needed cooling shade. Mostly, it gave us the peaceful reprise from a busy summer schedule we were all hoping to have.